It’s taken a while for us to get these pictures onto the site, but here’s all the action from the 34th annual women’s basketball banquet. Brittany Ford is awarded a commemorative basketball by Coach Cindy Griffin for her 1,000th point. The team poses for a picture with their letterman gifts. Assistant coach Stephanie McCaffery poses with senior guard Amy Gillespie and her Loyalty and Leadership Award. Other award recipeints included Michelle Baker for the Roosevelt Hunter Community Service Award, Katie Kuester for the Patricia Ryan Unsung Hero Award, and Shelby Smith for the Reverend Emory Ross Academic Excellence Award. An emotional Djouara accepts the Chris DiJulia Inspirational Award from assistant Coach Sue Moran and Chris DiJulia, himself. Moran gives Ashley Logue her award as Most Improved Player. The center also picked up the Big 5’s Most Improved Player honor. Chris Day presents Brittany Ford with the award for Best Offensive Player. Gillespie also takes home Best Defensive Player honors, much to her surprise. Logue takes home the big prize of the night as the team’s Most Valluable Player, awarded by head coach Cindy Griffin. Mariame Djouara is recognized for her 1,000 career points in her college career, both at St. Joe’s and South Plains Junior College. Director of Athletics Don DiJulia shares his comments on the team. Jack Jumper of Athletic Communications was the emcee for the night. In what has become somewhat of a yearly tradition, a handful of the biggest track and field stars in the world, including three-time Olympic gold medalist Usain Bolt, descended on St. Joe’s for a warm-up ahead of this weekend’s Penn Relays. Athletes from Jamaica, Canada, Germany, Russia, Trinidad & Tobago, and Team USA were all on campus to use the Finnesey to loosen up before the weekend’s marquee events. A Puma commercial? Nope, just another day at St. Joe’s. Team USA and SJU: a not-so-unlikely combination. Bolt has time for jokes during warmup. Team Canada stretches their legs during the session. Bolt in his pre-warmup gear. Bolt (blue Puma shirt) and his teammates practice handing off the baton. Russia’s women’s sprint medley relay also paid Finnesey a visit. Bolt and a teammate chat strategy. Bolt leads his team around the corner. Members of the USA women’s relay contingent were also in attendance. The practice session drew a crowd of students in between their afternoon classes. There really is nothing like playoff hockey: the intensity, the insanity, the towel-waving, whited-out crazed throngs of fans, the collective rise and fall of thousands of hopes and dreams with every hit, carom, and deflection. The difference in the playoff brand of hockey from its regular season counterpart is greater than the change that occurs in any of the other four major sports (with the possible exception of Major League Baseball, but that’s a numbers game of condensing the efforts of 162 games into a mere seven games where talent and ability are more likely to give way to sheer dumb luck). The hits are harder. Every slap shot has just a little more gusto behind it. Every player is just a little more willing to sacrifice life and limb in the path of a slapper to get that much closer to hoisting Lord Stanley’s Cup. It is, without a doubt, one of the greatest happenings in sport, and it plays itself out over two shiner-filled, scraggly-bearded months. With two days and seven games of the 2010 Stanley Cup Playoffs already in the books, I’ve got seven observations—one for each series underway—to whet your appetite for the quest for the most prestigious trophy in sports. There’s something amiss about this year’s Pittsburgh Penguins. (Disclaimer: I am a Pens fan who’s watched 65 of their games this year; prepare for more detail than you ever could have wanted.) I thought Pens in six was a pretty safe bet over the Senators, who the boys from the Steel City quickly dispatched two years ago en route to their first of two straight Eastern Conference Championships. This team just doesn’t have the mojo last year’s Cup winners did, and the first round matchup doesn’t help. If there’s one aspect where the Pens would have an advantage borne out of their experience, it’s their grit, hustle, and ability to pressure a team into mistakes. But Ottawa is one of the grittier teams in the playoffs, and their ability to forecheck effectively against the Pens and grind their attacks to a halt in the neutral zone is a testament to that. It helped that they got a lot of bounces to go their way (see goals 2-4), but they certainly earned the win. It was to a team that on Wednesday looked like it lost that winning feeling (thank you, Righteous Brothers.) They weren’t able to impose their will, and even when they did, quickly relapsed and were answered by the gritty Sens. The Pens weren’t playing their puck possession, shooting gallery-type game (much to the benefit of a not-so-convincing Brian Elliott in goal). The pace resembled that of a college basketball game in that each team had runs of sustained pressure that may or may not have led to a goal. And like so many college games, the Pens spent so much energy in the fight back that they had to let up on the gas and didn’t have enough to finish the deal. The search for a new men’s soccer coach at Saint Joseph’s has ended with the return of one of the program’s highest profile alumni. 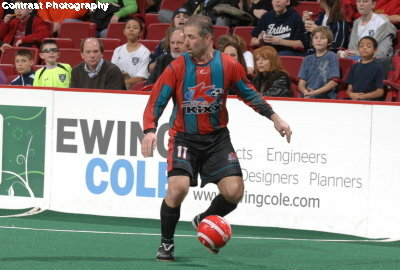 Don D’Ambra, a long-time star for the Philadelphia Kixx indoor soccer franchise and a 1994 graduate of St. Joe’s is returning to his roots to head up the team that helped catapult him into the pro ranks. He will be unveiled at a press conference on Monday. He’s just the fourth coach in St. Joe’s soccer history, replacing Tom Turner after 26 seasons at the helm. D’Ambra was the face of the Kixx for 14 seasons, the last eight of which he served as a player/coach/vice president of soccer operations. He led the franchise to Major Indoor Soccer League (MISL) titles in 2002 and 2007, and one of most recognizable figures for one of indoor soccer’s most popular teams. He also served as Turner’s assistant here at St. Joe’s from 1996-99. The 37-year-old native of Philadelphia collected 388 goals, 905 points, four All-Star selections, and 119 coaching wins with the Kixx, all franchise highs. D’Ambra’s time at St. Joe’s was just as illustrious, as his name is on the top line of most statistical categories. He’s the all-time leader in points (102), goals (41), and shots (297). His 15 goals and 38 points in 1993 are the most ever in a single season for a Hawk, and he also holds the third most prolific season (13 goals and 31 points in 1992) in those categories. He was honored as the 1993 Soccer Seven and Atlantic 10 Player of the Year for the winningest team in St. Joe’s history (12-6-1). D’Ambra was also inducted into the St. Joe’s Soccer Hall of Fame in 2000. He’s the second former Kixx player to join the Hawks’ current coaching staff, with former teammate Drew Kopp also an assistant on the women’s team.